Can Greek Oregano Improve Digestion? Yes! Adding Greek oregano to your diet has many known health benefits, and we seem to be finding out more and more every day. We know that oregano appears to be a cancer preventative, can help with decreasing bone loss, is a strong anti-oxidant, preserves food, and fights harmful bacteria. Now, two recent studies have been published that studied the effects of Greek oregano on digestion. One paper was released on February 21, 2018 and is presently “in press,” ready to be published, that looked at supplementation in dairy cattle, while the other paper, published in October of 2017 studied the effects of oregano supplementation on digestion in goats. While it is pointed out that the studies were done on ruminant animals, it is quite possible that there would be similar beneficial effects on digestion in humans. This study, led by N. Paraskevakis at the Department of Animal Physiology and Nutrition, Agricultural University of Athens, Athens, Greece, involved two groups of goats, one a control group that were fed normally, and the other group fed a diet with Greek oregano (Origanum vulgare ssp. hirtum), over the course of 69 days. The study discovered that supplementation of 20 grams of oregano increased protease activity which improves the digestion and use of proteins, especially proteins from plant sources. The supplemented group were also found to have decreased numbers of some bacteria strains including Peptostreptococcus anaerobius, a strain that can live in human digestive systems and under some circumstances, cause infections and illnesses. Additionally, methanogens which are bacterial strains responsible for methane production were also reduced in the supplemented group. It is quite possible that extra supplementation of Greek oregano could benefit human digestive systems by attacking the same harmful bacteria that can exist. Research conducted at the Department of Veterinary Medicine, Escola de Medicina Veterinária University Center and the Department of Animal Science, Universidade Federal do Rio Grande do Sul in Rio Grande do Sul, Brazil involved separating groups of dairy cattle with a control group, a group fed green tea extract, a group fed with an oregano extract and the other, fed a supplementation of both oregano and green tea. This study showed that oregano supplementation had similar effects on methanogens as in the goat study, discussed above. For those that have problems with gas and digestion, increasing your oregano may very well help you see some improvement. Of course, you should also seek professional advice for any serious digestive condition! 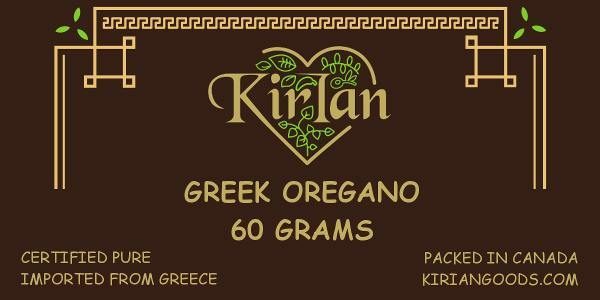 Our Pure Greek oregano will also provide you with a great bold flavour, not commonly found in North American branded oreganos. In addition, it’s been lab tested and certified by The Food Allergens Laboratory (Greece). 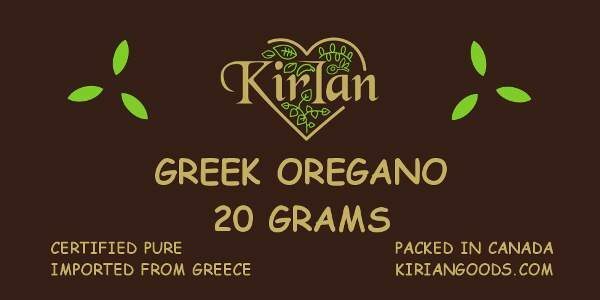 We know you will love this oregano when you add it to your favorite Greek, Italian and North American meals!